Description: Three UP loco's (SD60M, C41-8W, SD40T-2) lead a mixed freight west. Description: Three UP units on CSX Q689 struggle upwards through the kudzu approaching Talbotton, GA on the Fitzgerald sub. Description: The solid UP consist on CSX Q689 is in full dynamic as the train descends toward the trestle over Big Lazar Creek south of Woodland, GA. Description: A UP Train goes over Santa Fe Jct. on the Double Deck Kaw River Bridge on the KCT. Kevin and I found this spot to observe from on West Cambridge Ave. I'd seen this angle, but couldn't ever find out how to get here. Description: A UP manifest heads west out of Kansas City. Description: Well, to say that history repeats itself is sometimes a bit vague, but it did its best here. 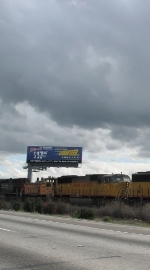 In 2006 I saw a Three Window SD60M lead a standard cab and another three window on a UP Superior train. This was one SD60 shy, but still very cool! Description: UP SD60M 2475 waits to depart Bensenville Yard with G39. Description: Cadillac's leading a Yermo bound Repo!